In this Greg Doran’s ambitious Royal Shakespeare Company [RSC] production, the action migrates from ancient Rome and finds itself in contemporary Africa. In making this link the RCS’s recently appointed Artistic Director says he was inspired by many things. Amongst them reports of Nelson Mandela and other Robben Island political prisoners’ devotion to an illicit copy of the Complete Works of Shakespeare as well as South African notable theatre figure John Kani’s oft-quoted statement that Julius Caeser is The Bard’s African play. In addition, Doran reflects on the recent Arab Spring upheavals in Tunisia, Egypt and Libya. Be that as it may, political assassinations and intrigue are no more prevalent in Africa than in Western Europe and the Americas - regions that profess to lead the world in political sophistication but only succeed in hypocrisy and double standards. With an all-Black ensemble of some of Britain’s best actors retelling the story of this violent conspiracy and the eventual defeat of the perpetrators, Michael Vale’s strongly designed set puts a giant statue of Caesar towering above the stage, symbolically looking away from the masses he leads. And in the opening scenes these people await Caesar’s festive arrival before The Soothsayer [Theo Ogundipe], staggers in tattered and chalky-faced predicting the bloody events, interrupting Akintayo Akinbode’s lively and evocative percussion based music. In the grand surroundings of London South Bank’s Noël Coward Theatre, Julius Caesar [Jeffrey Kissoon] has returned to Rome from a triumphant war but his people’s adulation is resented by some of his erstwhile comrades who, suspicious of his influence and authority, decide to assassinate him. It’s not just petty rivalry though and the plotters justify their murderous plans with appeals to democracy and opposition to a dictatorship. This all leads to a series of intense, powerful scenes in which the killers are initially successful in winning support for their treachery, but are soon denounced following the mesmerising oratory of Caesar’s close friend Mark Antony. It’s Cyril Nri’s neurotic Caius Cassius who initiates the violent conspiracy mobilising Marcus Brutus [Paterson Joseph] whose indecisive wavering is soon overcome in the belief that the leader’s death is essential as an act of political succession and for the good of the country. Ray Fearon’s bold and strong Mark Anthony has definite swagger, confidently delivering the lines in his famous speeches [‘let slip the dogs of war’, ‘Friends, Romans, Countrymen’ etc.] 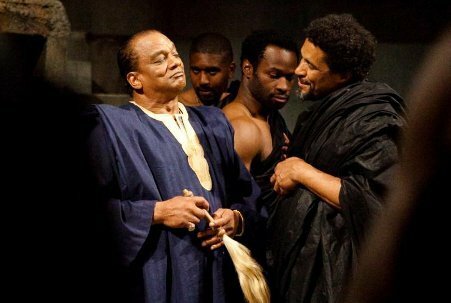 There are also beautifully delivered performances from Simon Manyonda as the fragile and sleepy Lucius, Joseph Mydell as Casca, Theo Ogundipe as the part shaman, part obeah-man Soothsayer. And Ann Ogbomo as Ceasar’s wife Calpurnia and Adjoa Andoh as Brutus’ spouse Portia transform small female roles into displays of moving influence on their husbands. With William Shakespeare, the language - lyrical, full of allusions and obscure references - is paramount. To tell the story, to get the best out of actors, direction must be on point - especially where many in the audience may already be daunted by the poetic, complex, verse-like dialogue. Performers need to be at the top of their game, and deliver the Bard’s lines expertly, convincingly; with no room for hesitation, or uncertainty. It’s safe to say then that since the start of its nationwide tour in May at Stratford’s Royal Shakespeare Theatre that this production passes every test. But the issue remains: Is this play, which dramatises divided loyalties, the inconsistency of popularity and the fleeting lifespan of political power entertaining? The answer here is a definite yes, with an ensemble of well-drilled, serious and experienced performers at the peak of their skills – with all adeptly and tirelessly maintaining an admittedly generic African accent. For sure, Shakespeare words are infuriatingly difficult to navigate through and could even be a barrier but as a spectacle this most famous and definitely challenging thriller is first class. Catch it in London whilst you can – or at one of the provincial theatres before it leaves the country for a short run in Moscow.